Most causes of uterine inversion are commonly associated with uncontrolled cord traction or excessive fundal massage, though there are cases in which no tension was applied to the cord.5 Additionally, a placenta that has partially detached or invasive placentation may increase the risk of uterine inversion.6 Fetal macrosomia, primiparity, fundal placentation, uterine lesions or anomalies, short umbilical cord and a rapid delivery have been considered theoretical risks, but these causes are present in fewer than 50 per cent of cases.7 8 9 Uterine inversion can occur with minimal predisposing risk factors. Figure 1. Johnson’s Manoeuvre – manual reduction of uterine inversion. Figure 2. Hydrostatic reduction of uterine inversion. Uterine inversion requires early diagnosis and rapid management. Management has two key elements. Firstly, return of the uterus to its anatomical position promptly while preventing re-inversion. Secondly, the management of postpartum haemorrhage while counteracting haemodynamic instability. The latter requires adequate intravenous access and aggressive fluid and blood product resuscitation. Uterotonic agents should also be ceased if uterine inversion is diagnosed, until after replacement of the uterus. If conservative measures have been unsuccessful or the patient is haemodynamically compromised, surgical correction is the next appropriate step (Figure 3). The most common approach involves a laparotomy followed by the Huntington procedure and/or Haultain procedure. On entry into the abdomen, a cup-like structure is usually visualised in place of the uterus with the bilateral round ligaments, fallopian tubes and ovaries being retracted inwards. This is the cervical ring structure. 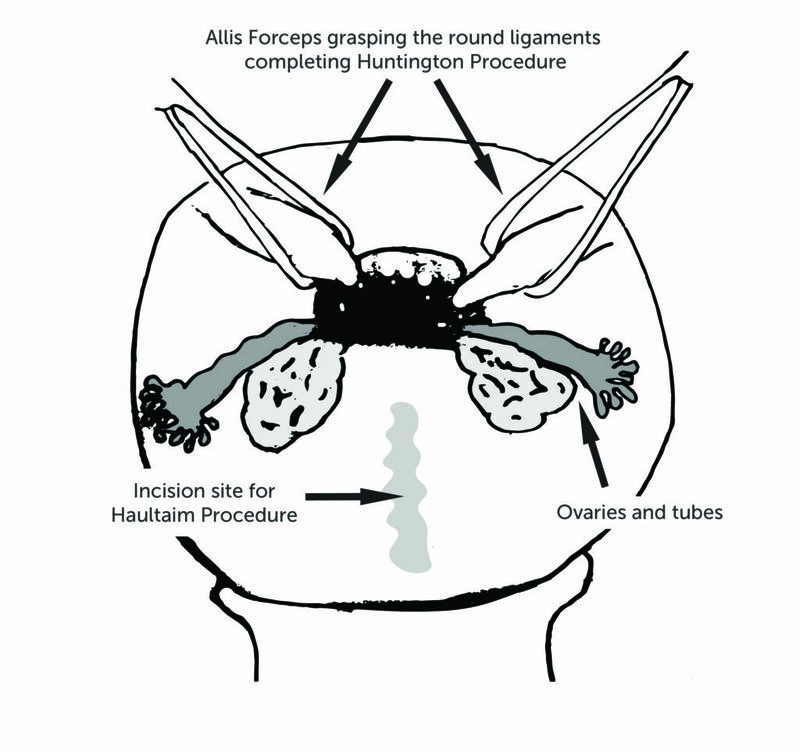 Huntington’s procedure involves a replacement of the uterus by retracting the fundus superiorly with atraumatic instruments (Allis forcep or Babcock clamp) grasping the round ligaments and reapplying medially as more of the round ligament becomes visible. Simultaneously, reduction may also be attempted vaginally to facilitate correction of the uterine inversion. Haultain’s procedure involves a sharp dissection of posterior aspect of the uterus. The incision is to release the constriction ring, allowing additional space for manual replacement of the uterus, or Huntington’s procedure to be completed. Finally, a repair of the posterior incision concludes this procedure. An anterior incision or Ocejo incision may also be considered, but with some risk of a bladder injury due to distortion of the anatomy immediately postpartum. Figure 3. 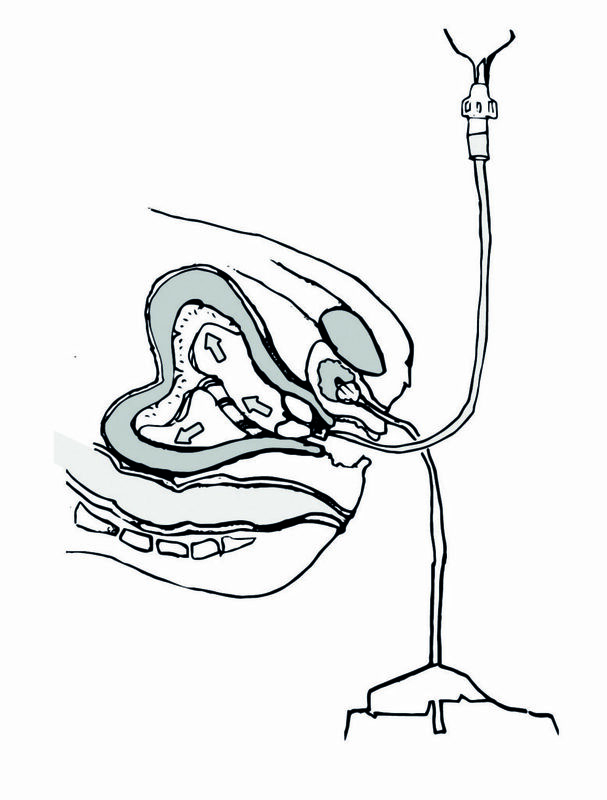 Surgical reduction techniques of uterine inversion. There are published case reports of laparoscopic-assisted reduction of uterine inversion and vaginal approaches to dissection of the cervical constriction ring (Spinelli’s procedure), but these are performed rarely.29 30 No cohort studies or trials are available to evaluate success rates or compare surgical interventions for uterine inversion due to the low incidence of failed conservative reduction. Delivery of the placenta should only occur after repositioning of the uterus. Manual removal of placenta was completed in most case reports, after uterine replacement, followed by administration of uterotonic agents to minimise blood loss and prevent re-inversion of the uterus.10 Some case reports have also documented the use of an intrauterine balloon catheter (Bakrii) to again assist with any blood loss and prevent reinversion.31 Lastly, to prevent postpartum endometritis, broad spectrum antibiotics should be considered. Uterine inversion is an obstetric emergency that requires prompt diagnosis and management to prevent maternal morbidity and mortality. Due to its scarcity, practitioners will have limited experience, but with early diagnosis and timely management to replace the uterus while preventing haemodynamic compromise, a good outcome can be anticipated. Owing to the lack of predisposing features for uterine inversion, clinicians should be ever vigilant about uterine inversion in situations that involve a postpartum haemorrhage. Humphrey MD, Bonello MR, Chughtai A, et al. Maternal deaths in Australia 2008-2012. Australian Institute of Health and Welfare Media Release. 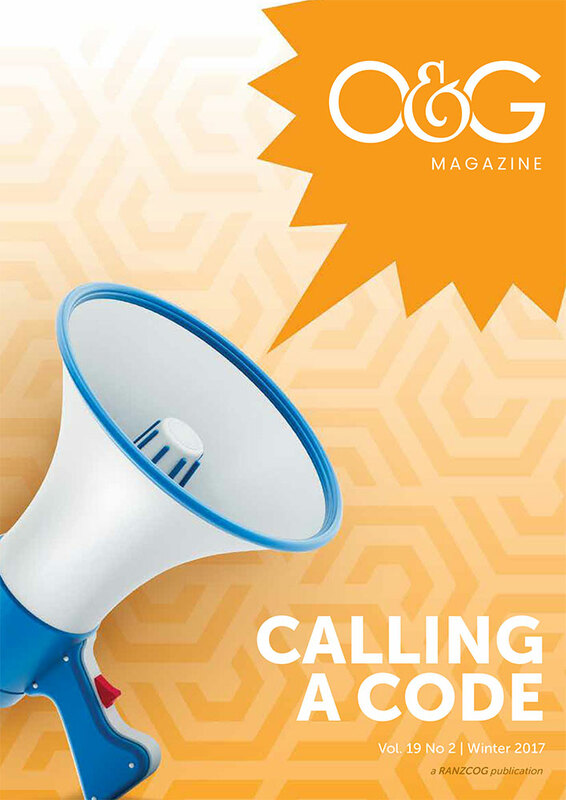 Published 10 June 2015. Available from: www.aihw.gov.au/publication-detail/?id=60129551119. Thiam M, Niang MM, Gueye L, et al. Puerperal uterine inversion managed by the uterine balloon tamponade. 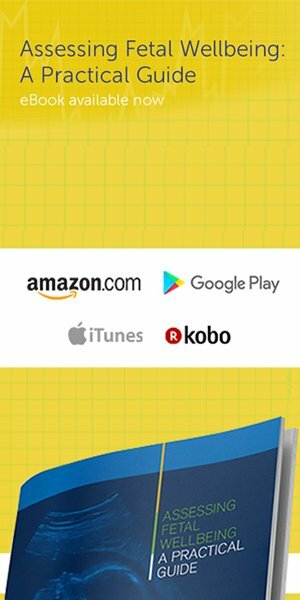 Pan-African Medical Journal. 2015;22:331. Ihama Y, Fukasawa M, Ninomiya K, Miyazaki T. Acute puerperal uterine inversion. Forensic Sci Med Pathol. 2014;10:272-74. Leal RF, Luz RM, de Almeida JP, et al. Total and acute uterine inversion after delivery: a case report. Journal of Medical Case Reports. 2014;8:347. Ida A, Ito K, Kubota Y, et al. Successful reduction of acute puerperal uterine inversion with the use of a Bakri Postpartum balloon. Case Rep Obstet Gynecol. 2015;2015:424891. Witteveen T, van Stralen G, Zwart J, van Roosmalen J. Puerperal uterine inversion in the Netherlands: a nationwide cohort study. Acta Obstet Gynecol Scand. 2013;92:334. Adesiyun AG. Septic postpartum uterine inversion. Singapore Med J. 2007;48:943. Pauleta JR, Rodrigues R, Melo MA, Graça LM. Ultrasonographic diagnosis of incomplete uterine inversion. Ultrasound Obstet Gynecol. 2010;36:260. Morini A, Angelini R, Giardini G. Acute puerperal uterine inversion: a report of 3 cases and an analysis of 358 cases in the literature. Minerva Ginecol. 1994;46(3):115-27. Beringer RM, Patteril M. Puerperal uterine inversion and shock. Br J Anaesth. 2004;92:439. Kawano H, Hasegawa J, Nakamura M, et al. Upside-down and inside-out signs in uterine inversion. J Clin Med Res. 2016;8(7):548-549. Smith GN, Brien JF. Use of nitroglycerin for uterine relaxation. Obstet Gynecol Surv. 1998;53:559. Momani AW, Hassan A. Treatment of puerperal uterine inversion by the hydrostatic method; reports of five cases. Eur J Obstet Gynecol Reprod Biol. 1989;32:281. Vijayaraghavan R, Sujatha Y. Acute postpartum uterine inversion with haemorrhagic shock: laparoscopic reduction: a new method of management? BJOG. 2006;113(9):1100-2. Kitchin JD 3rd, Thiagarajah S, May HV Jr, Thornton WN Jr. Puerperal inversion of the uterus. Am J Obstet Gynecol 1975;123(1):51. Soleymani Majd H, Pilsniak A, Reginald PW. Recurrent uterine inversion: a novel treatment approach using SOS Bakri balloon. BJOG. 2009;116(7):999-1001.